I've been a fan of Jody Hedlund's for several years now, so I was anxiously awaiting her newest book in the "Beacons of Hope" series (which I'd thought she'd finished! ), Never Forget. I had it in my hands towards the tail end of our Christmas Break and enjoyed my last weekend off snuggled up and reading it. It was wonderful--no surprise there:) Here's a short blurb and we'll chat on the other side. 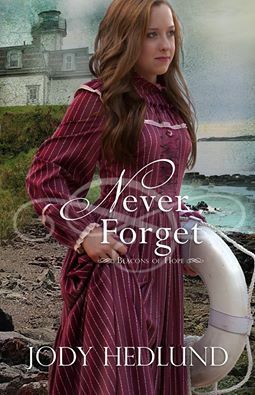 Rose Island Lighthouse, Rhode Island June 1880 Will she betray his trust to stay on the island she loves? Abbie Watson is content to spend her days clamming, crabbing, and tending Rose Island Lighthouse. Her grandpa is the head light keeper, but his senility may lead to their eviction. Since leaving the island would kill her beloved Gramps, Abbie will do anything to keep him in the one place he knows and loves. Wealthy Nathaniel Winthrop III’s wild living has gained him a reputation as the ‘bad boy’ among the elite social circles of Newport. After a blow to the head in a yachting accident washes him up on Rose Island, Nathaniel has no memories of his past. Abbie tends the wounded stranger in her home only to realize he assumes they’re married. Although she knows she needs to correct Nathaniel’s mistake, his presence calms Gramps and provides a way to prevent eviction from the lighthouse. The longer the charade continues, the harder it gets for Abbie to tell Nathaniel the truth, more so as she begins to fall in love. Everyone she’s ever loved has abandoned her. Will Nathaniel leave her too, once he discovers he’s not really her husband? The set-up for this book completely intrigued me. I was hooked as soon as I saw the blurb. And the story did not disappoint. The interactions between Abbie and Nathanial...well, let's just say they were exactly what each other needed. But not only did I love watching their relationship develop--and wonder how it could survive the truth once it inevitably came out--I also loved Abby's relationship with her Gramps. He was a wonderful addition to the story that only deepened its layers. Never Forget was a treat to read. I've come to know what to expect from Hedlund's books, yet they never feel like I've read them before. She's a trusted author who once again weaved a unique story that still delivers a fresh happy ending. And while this is book 5 in the "Beacons of Hope" series, it is very much a stand-alone as well. Feel free to start with this one and work your way through the others:) You can purchase Never Forget here.